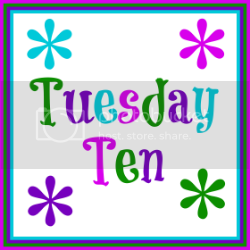 Today's Tuesday Ten Topic was to research the year you were born and share the top ten headlines or songs. This is very appropriate considering that Rabia and I both celebrated birthdays earlier this month! My dad is a history buff and there's a bit of that in me, too, as you will see. To be honest, once I started researching, I couldn't stop and there was no way I could narrow it down to only 10 headlines, so I have listed headlines from 10 categories! Don't worry - they're headlines, so they're short! Den Xiaopng was restored to power in Chins as the "Gang of Four" were expelled. The Nuclear Proliferation Act was signed by 15 countries aimed at curbing the spread of nuclear weapons. Indian Prime Minister Indira Ghandi was defeated. The first female Episcopal priest was ordained. Presiden Carter pardoned Vietnam War "draft dodgers." U.S. government ordered that all cars were to be equipped with seat belts by 1984. The Department of Energy was created. The U.S. signed a treaty with Panama to relinquish control of the Panama Canal by the year 2000. The median household income was $13, 572. A first class postage stamp would cost you $0.13. The average price of a movie ticket was $2.25. A gallon of gas ran about $0.64. Oakland defeated Minnestoa to win the SuperBowl. The NY Yankees defeated the LA Dodgers in the World Series. Marquette defeated North Carolina to take the NCAA championship. AJ Foyt set a new record for consecutive victories by winning the Indianapolis 500 for the fourth straight time. Star Wars hit theaters for the first time. The TV miniseries Roots sired on ABC and surpassed Gone With The Wind as the highest rated TV program ever. Saturday Night Fever sparked the disco inferno and made movie soundtracks popular. the first episode of The Love Boat aired. There you go!! 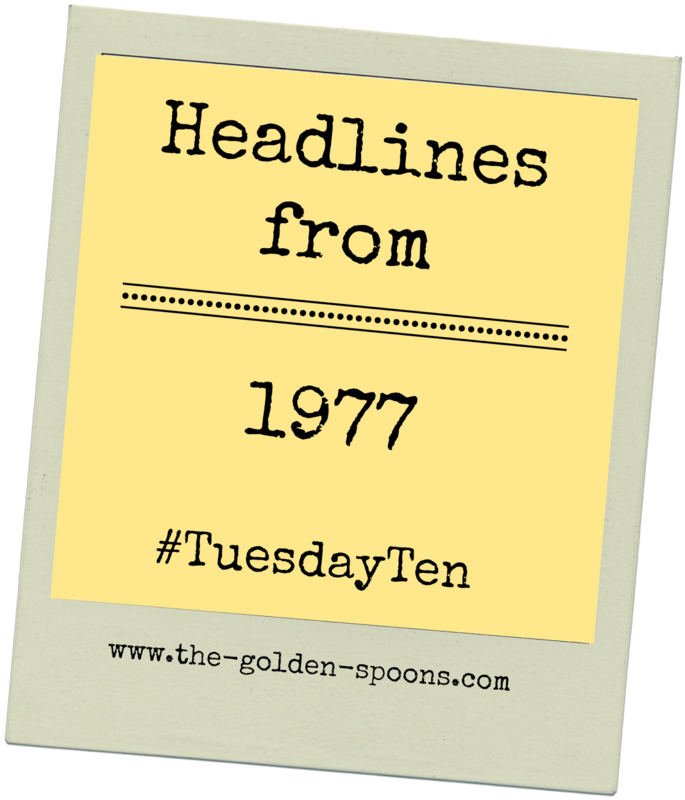 The headlines from 1977, the year I was born. Some people find history boring, I know. But, I thought this was fun. In fact, I think I might do it for each of my girls on their birthdays later this year! It is truly amazing how much has changed in the past 37 years! What was happening in the year you were born?? Look it up, write it up, and share! This was fun! I'm not necessarily a history person, but I enjoyed finding out about the things that happened 36 years ago. When it comes to birth years, I think I'm in some pretty good company! My baby sister was born in 1977! I remember her coming home from the hospital. I also remember my dad taking me and my other sister to see Star Wars in the theater. 1977 was a great year! This was definitely a fun walk down memory lane. I think the thing that struck me the most as I was doing mine was how much technology has changed! Hearing about the Apple Computer made me think it again! I was a sophomore in high school in 1977, so this was a great walk down memory lane for me....I remember all the songs on both of your music lists!!! I thought it was lots of fun, too! Can't wait to read them all! HA! What a cute memory! Glad this made you smile! Yes - it really is incredible how much technology has changed and how that has changed the way we live. :-) I really thought I would recognize ore of the music, but I didn't! Thanks Marcia! So glad you had fun with this. It sure would be nice if gas was still just $.64! Wow, some really famous deaths in 1977! And you were the year of Star Wars!! So cool. My sister was 1978 so I read Rabia's post with interest too. I was 1980 and I'd really like to go learn more. Thanks Dana! My mom has told stories about having to get my grandparents to drive her places while my dad was at work because there were no car seats and she couldn't hold me & my bother while driving! Compared to today it seems almost archaic! I like your take on this. I especially like the economics section. My how times have changed! Ooh, I want to look up some of this kind of stuff for my 40th birthday post coming up next month. Can you point me to where you found all this info? I found it on several different sites. Just did a google search for "1977 Headlines" and "Top Songs of 1977." Wow. There seems to be a lot going on the year you were born. How interesting to find out. Oh LISA I should have done this hop instead of accepting the sponsored post I got for OL, because I love this kind of stuff. Needless to say, I was born 9 years before you (am OLD) and remember when Steve had the Apple Lisa and the Apple 2 because my dad had them both. Yikes. Love this though!! Can you remind me next week what the subject is?